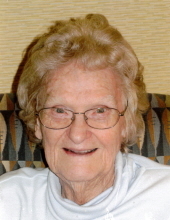 Thelma Orlena Miley, of Rolla, passed away Monday, November 26, 2018 at the age of 97. She was born in Rolla on March 25, 1921 to the late Everett and Orlena (Lenox) Clayton. As a toddler, Thelma contracted diphtheria which caused a nearly complete loss of hearing. She battled through it however and endured. On March 23, 1967 she married William L. Miley, who passed away unexpectedly a few years later. Mrs. Miley is survived by her cousins and extended family members and friends. A funeral service for Thelma Miley will be held at 3 pm Sunday, December 2, 2018 at the Null and Son Funeral Home in Rolla. A visitation for family and friends will be held prior to the service Sunday beginning at 2 pm at the funeral home. Memorial contributions are suggested to the Resident Activity Fund at the Rolla Manor Care Center. To send flowers or a remembrance gift to the family of Thelma Orlena Miley, please visit our Tribute Store. "Email Address" would like to share the life celebration of Thelma Orlena Miley. Click on the "link" to go to share a favorite memory or leave a condolence message for the family.